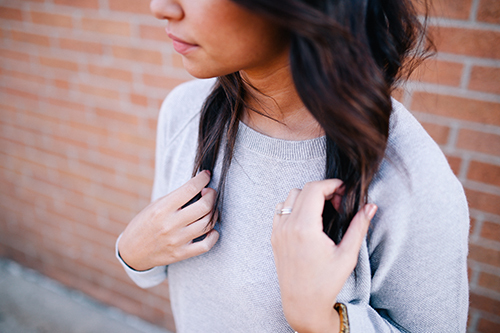 God’s love and compassion in all that we do. 2015 was a year of gearing up for big changes in how services will be delivered for the most vulnerable in our community. While we continue to serve over 50,000 people each year, it has become more important than ever to look at whether our programs are still relevant and provided in ways that maximize available funding and resources. 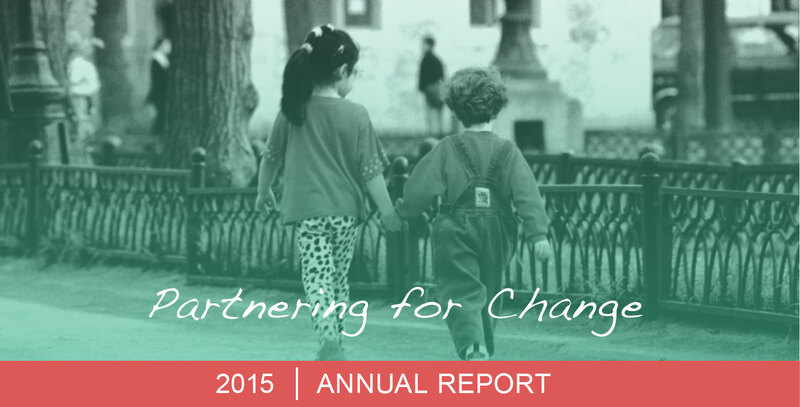 Our theme is “Partnering for Change” as we work on new collaborations locally and across New York State. By coming together in new ways with other groups, we can bring the best of each entity to bear in serving people most in need. The positive energies of many make our services possible. It is with profound gratitude that we recognize our Diocesan Leadership, Board of Directors, dedicated staff and volunteers, donors and supporters: you make it all possible. Finally we thank those who we are honored and privileged to serve and walk with on their individual journeys of change. In an historic groundbreaking action, Catholic Charities was approved by the NYS Department of Health to expand its Adult Health Home to serve high need children in collaboration with the Dioceses of Buffalo, Rochester, Albany and the Northern region. “Encompass” will work in 48 counties with children who have special medical, behavioral health and trauma related needs by coordinating care and promoting prevention and good health. Over 100 agencies across upstate New York will partner with Encompass to support positive health outcomes for children and their families. The vision and support of our Diocesan Director, Joe Slavik and fellow Diocesan Directors along with the leadership and guidance of the New York State Catholic Conference was instrumental in making this happen. Also of historic note, Mother Teresa’s Cupboard, a collaboration of four western Broome parishes and Catholic Charities, celebrated its tenth anniversary in August. Sponsored by St. Ambrose Church and supported by the parishes of Most Holy Rosary, St. Joseph’s and Church of the Holy Family, Mother Teresa’s served 15,537 people in 2015 with a total of 233,055 meals. Financial assistance with utility bills, prescriptions, rental and clothing were also provided for people facing difficult life situations. An inaugural event, “First Step” in conjunction with Over the Edge, celebrated the courage it takes for people to take that first step to getting help as over 40 media and local citizens rappelled ten stories down the side of the DoubleTree Hotel and raised funds for Catholic Charities programs. People who participated included those who have been aided in the past by Catholic Charities and people who wanted to personally challenge themselves. Others celebrated special achievements in overcoming life or health challenges. This one of a kind event called attention to the agency mission and the many services that it provides. As anyone who has fallen off a horse knows, the first thing you need to do is get back on. Many of the people served by Catholic Charities have fallen down on their luck, lost their jobs, are out of food or are homeless. 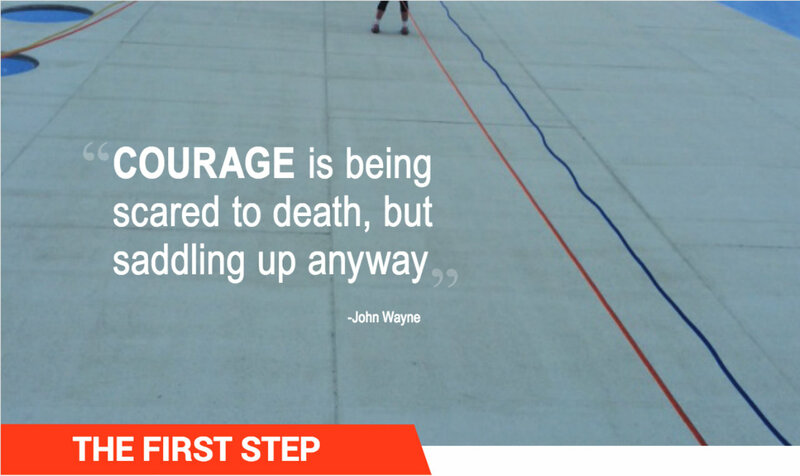 That is why we launched “The First Step” to celebrate the courage it takes to face obstacles, get back in the saddle and back on course. We all know from our own experiences that taking that first step after a setback is often the hardest. 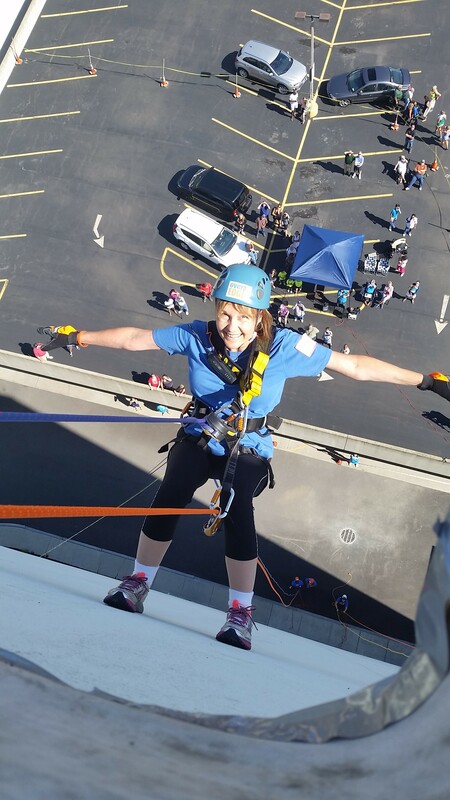 On August 20th and 21st, over forty people rappelled down the side of the beautiful DoubleTree Hotel to show their support of all people who take that difficult first step to get help. We celebrate their courage and sense of adventure and appreciate their support for the many services provided by Catholic Charities. IRAs are single family homes for people with developmental disabilities. They are certified and regulated by the NYS Office for People with Developmental Disabilities (OPWDD). There are eight homes located in Endicott, Endwell, Binghamton and the Village of Port Dickinson. The adult men and women living in these homes have varying degrees of abilities and interests. They are involved in a variety of vocational, social and recreational activities in the community depending upon their personal preferences. Each individual and their family have chosen this program and work together with the staff to develop a person centered plan designed to meet the individual’s selected valued outcomes. Each person has a Medicaid Service Coordinator (MSC) chosen by them from one of the 6 local agencies providing the service. The MSC assists in connecting the person to those services which the team determines to be the most appropriate supports. All service providers along with the individual and their family make up the “Team.” The IRA is home as long as people want to live there. Many people will stay for a lifetime. Others, by their choice, may move to other preferred locations. 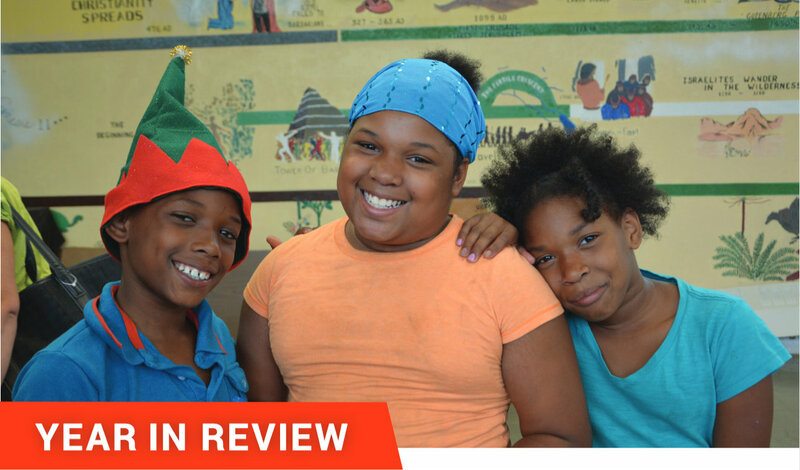 Satisfaction survey results of individuals residing at Damon Hall, Twin Rivers Certified Apartments, Supported Housing and the Boys Community Residence: indicated a 97% satisfaction with services, a 7% increase from 2014. Medicaid Service Coordination was provided to 253 individuals. 57 individuals with intellectual/ developmental disabilities were provided housing. The Supported Housing Program added 21 beds and required the hiring and training of additional staff. A Licensed Practical Nurse (LPN) was hired for the Mental Health Transitional Living Program. Addiction Services were provided to 270 individuals. Katie is a sensitive caring young woman with developmental disabilities who has been supported by the Catholic Charities Residential Program for a number of years. She recently moved from a home with twelve people to one with only four (including her). Her new home allows her to make more independent choices regarding her daily routine. Her bedroom is personalized to reflect her interests such as movies, sports memorabilia, music, and photos. Katie enjoys making herself a hot cup of coffee before she takes the bus to work in the morning. At night she can be found relaxing, helping with dinner, doing her laundry or socializing with friends, family and housemates. Assisted 350 volunteers to give over 35,000 hours of their time and service in 64 volunteer opportunities for 25 non-for-profit organizations in Broome County. One of the educational programs offered by volunteers is Tai Chi. Tai Chi is a graceful form of martial arts that has been tailored specifically for older adults and uses slow precise movements that can help them stay fit, reduce falls and some chronic diseases. Research done in several countries has shown that Tai Chi can reduce the risk of falling up to 55% and assists with improving arthritis, high blood pressure, poor balance, stress, and sleep patterns. The program led 7 Tai Chi classes with 116 participants. I have experienced short term memory loss – this class has helped to improve that condition. Class has instilled a certain degree of discipline in preforming each of the steps and maintaining the sequence of steps. I feel that it has helped my balance. It also has helped my mood – feel much better when I leave class and look forward to the next. I have arthritis in both knees. This program has helped improve my range of motion and strength in my knees. It has also helped with balance. Paul is a retired opera singer, vibrant senior and a self- proclaimed tai chi fanatic. Twice a week he volunteers with the Retired Senior Volunteer program (RSVP) as the new Tai Chi for Arthritis instructor. According to Paul, “all types of people can do it.” Paul became interested in tai chi after practicing yoga for many years and he continues to stretch every day. He believes that “to move, you’ve got to keep moving” and urges seniors to come out to the centers to give his class a try. Paul also worked for RSVP Transportation as a driver for ten years before the director called to see if he would be interested in leading this program. He jumped at the opportunity because he is passionate about giving back and believes “this organization is full of beautiful people” and that “volunteering makes life worthwhile“. His one hour classes are free and open to the public twice a week. The Division served 3,911 youth, 1,065 families, 427 adults and 707 seniors, through programs that encourage and support personal growth and development. These community based services prevent youth from entering out of home placement or psychiatric hospitalization, resulting in significant cost savings. Services also promote health and wellness by providing nutritious food, counseling and by helping seniors remain active and connected in the community. Catholic Youth Organization (CYO) saw an increase in growth with 1,776 new participants and a total of 2,603 youth served. 730 spectators attended the annual cheerleading competition held at the BU Events Center to support 146 cheerleaders from local parishes. The 9th Annual Jim Roma Sr. Memorial CYO Golf Tournament which benefits the Jim Roma Scholarship fund attracted 164 golfers. 12 local graduating seniors were presented with a $500 scholarship. Functional Family Therapy (FFT) provided in-home family counseling to 93 at-risk youth and their families. Participants who completed the program improved their parenting skills, reduced conflicts and improved overall communications. This prevented out of home placement by 99% and saved the county $7,290,372.00. Gateway, a barrier free service, monitored 44 youth through group psychotherapy sessions and 21 individually. 100% who attended group sessions reported improved communication, behavior, school attendance and performance up to 2 years after receiving services. 100% attending individual sessions stayed out of placement 2 years following services. Four Seasons Club opened on March 28, 1983 in a building on the corner of Clinton and Jarvis; in 1990, the club moved to 290 Front Street to keep pace with its growing membership. Clubhouse units include prevocational units such as reception and member outreach, kitchen and snack bar, a maintenance unit, horticultural unit/garden, clerical unit as well as the Wares Like New thrift shop. The Club runs a consignment shop for members who make things, takes on community service projects like Adopt a Highway and provides a variety of social events during the day and on evenings. Transitional Employment and education is also at the heart of club and members are placed in part time positions in the community to learn and test job skills. Four Seasons is closely linked to CC Employment services for job development, placement and coaching. Key to the concept is that members are the heart of the club and when they are not there, they are missed. The social support is strong and traditions like Thanksgiving Dinner put on by staff and members are part of the fabric of the club. Members have always been active in their own advocacy and participate in the yearly legislative visits and meetings sponsored by the statewide trade organization, New York State Association of Psychiatric Rehabilitation Services, (NYAPRS). It is not unusual for folks who initially come to the club to be withdrawn and non-participatory. However, experience has shown over and over again that exposure to this healing and inspiring milieu results in engagement and recovery. The Club incorporates best practices such as Mary Ellen Copeland’s Wellness Recovery Action Plan (WRAP) promoting recovery and making possible a better quality of life for people with a serious mental illness. In terms of positive outcomes, 93% of members stayed out of the hospital in 2015; the cost for a year of services at Four Seasons is roughly equivalent to one week of hospitalization. 76 mental health staff provided caring, compassionate and high quality services to approximately 2500 people through 54,989 contacts. Protective Services for Adults (PSA) provided case management and representative payee services to almost 300 people at risk of abuse and neglect. Services assist people in maintaining housing, ensure finances are managed and basic needs are met. Peer Staff at A Stepping Stone Drop in Center provided 35 – 40 people/day with a supportive environment, self-help groups to assist in recovery and a nourishing meal. Assertive Community Treatment served a total of 80 individuals to assist them with daily living needs and clinical treatment for their serious mental illness. Serene was still living with her foster parents when she joined the club in the fall of 1990. In 1991, she heard about Catholic Charities Residential Services. “My motivation was through the roof, so I applied and was accepted to the Supervised Living Program at Damon Hall, which prepares tenants for independent living.” In under a year she was able to transition to the Apartment Program and was living on her own. Simultaneously, with the help of a 4 Seasons job coach; she landed her first position working at Portfolios Café. This opportunity became the spring board for her future success working in the food service industry. Catholic Charities of Broome County (CCBC) is in its third year of operating as a Lead Health Home. Services support coordinated, comprehensive medical and behavioral health care to members with chronic conditions through care coordination. A “care manager” oversees and provides access to all of the services an individual needs to stay healthy, out of the emergency room and out of the hospital. The Health Home services are provided through a network of organizations – providers, health plans and community-based organizations. A staff of 28 includes Care Managers, a Peer Recovery Coach, Nurse Care Managers and Outreach Specialists; the program ended the year with 900 members with a total of 1038 served. The Health Home Nurse Care Managers are a unique and valuable part of the HH team as they advocate for the person’s medical needs and successfully communicate with various disciplines within the medical field. The Nurses facilitated health related groups including Summer Health Informational Session, Diabetic Related groups, Stress and Anxiety, Healthy Eating Habits and a series of Nutritional Classes. The part-time Peer Recovery Coach offers members a special connection that cannot be duplicated by other non-peer professionals, offering a sense of strength and hope in the recovery journey. In order to enroll participants, Outreach and Engagement services were offered during extended hours on evenings and weekends; 5476 individual outreach contacts were provided. Staff also reached people through setting up a table at local programs, like the food pantry and church events for the needy in order to increase awareness about Health Home services. 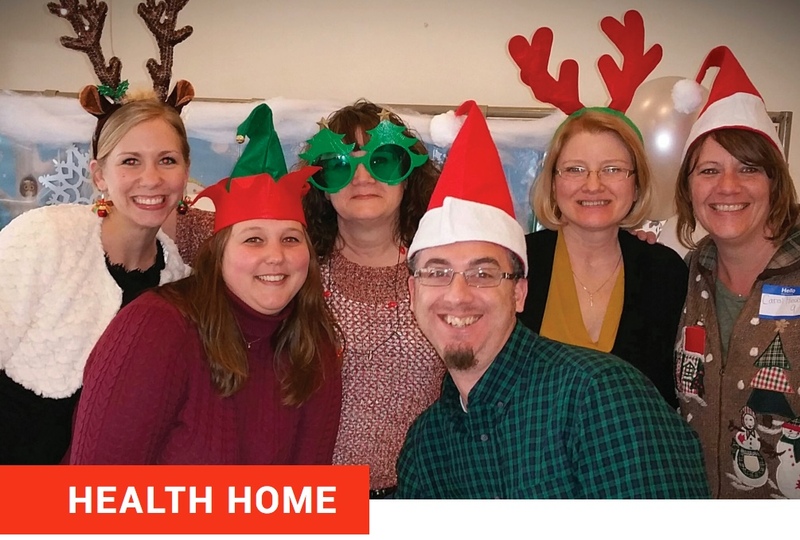 Catholic Charities Health Home also partners with care management agencies: Monroe Plan, Fairview Recovery Services, Lourdes Hospital, and Catholic Charities of Chenango County. Outcomes include a cost savings in health care of 18%, placing the Health Home fifth in the state. Annual satisfaction survey results showed an overall consumer satisfaction rating of 91%. Currently enrolled in the CC Adult Health Home, Nate is a bright and courageous twenty year- old who exudes energy. He enjoys walking around the city, biking, hiking and skateboarding. Originally from Alabama, Nate and his two sisters were put into foster care due to violent parents with drug issues. They moved to the area when he was six and a foster family was found that would take in all three children. Nate joined our Boys of Courage program when he was only 14 because “kids with anger issues don’t have a lot of outlets”. He found comfort within the structure, compassionate staff and activities offered, especially karate and parkour training. He has overcome his history of behavioral health issues, and is truly a success story. Now living on his own, he attends BOCES TASK program, is active in his church, as well as the Drop- In Center and is planning on joining the military. One day he hopes to give back by opening his own bike shop where he will offer free bikes to children who cannot afford them. “Partnering for Change” will be reflected in the upcoming year as we seek to work with many new entities to provide innovative, high quality services. Encompass LLC will be formed to solidify the governance structure for the new Children’s Health Home. Partnerships with over 100 care management agencies in upstate New York will be forged to serve children who are medically fragile, impacted by trauma, emotionally disturbed or involved with the juvenile justice system. Catholic Charities will partner with Lourdes to provide Project Search, an internship program for special needs youth transitioning out of BOCES. The first group of staff will graduate from the LeMoyne Leadership Institute. These six staff will be taking on special leadership projects within the agency and are expected to support our succession planning efforts to cultivate new leaders within the organization. New quality improvement systems will be developed to meet the requirements for managed care and to promote positive program outcomes. An Economic Independence project will be launched at our pantry services to assist people in moving out of poverty through developing plans and by offering educational opportunities in the areas of financial literacy, nutrition, housing, childcare and parenting. By encouraging a vision of self-sufficiency and mutual support, participants will identify the barriers that are holding them back from success in these areas.